This post is sponsored by Mohawk Flooring. All opinions are 1 million% my own and I’m happy to be working with a company that I believe in. We looked around for over two years before finding our dream home. And by “we” I mean me. But we finally found it. Everything was perfect. Except for the maroon carpet with a white floral pattern in the family room. Ugh. We knew we had to replace it before moving in and we did. The upstairs was carpeted in off white but was in great shape. With 3 kids and a dog. If you’re thinking that didn’t go so well… you are right. After seven years of living with the off white (now very stained) carpet, we finally were able to replace it. In the process I learned some things that I thought were worthwhile to pass on. That might be what lead you to this post. (awesome!) When I knew that we were going to get new carpet I went to the internets to read up on all of our local suppliers. I looked at reviews and found the right fit for us. Through Mohawk’s dealer Locator tool, I ended up with Carpet Clearance Warehouse and could not have been happier. The whole process for me was fantastic from start to finish. Ed the owner walked me through everything and was wonderful to work with. He gave me a tour of their facility, talked me through all of the details and was very clear about how it all would work. I asked about how things were calculated and for his opinion about what would be best for our family and home. There is a up to $500 off SmartStrand Anniversary Sale going on right now, so if you have been saving up to redo your flooring, now is the time! To find the right fit for you, research online, visit stores and showrooms and make some phone calls. Also ask around – I trust my friends who have been through it way more than I’d trust anyone else. Have the tough talks with different suppliers. This should be part of your research before you make the final decision. Make sure that you are clear on the entire process and the fees involved. Carpet is measured in square yards, not feet. And it is usually done in 12 feet widths. Which means that often they either have to put pieces together (which means more seams) or use one big piece to avoid the seams. If you visit a showroom and it says $x, make sure to ask what it would be out the door. All the fees and taxes add up very quickly. What you thought you’d pay $1,000 for turns into $3,000 in a couple of clicks on the calculator. This one seems obvious probably. But, there are so many different types of carpet. While you might love the look of shag, putting it in high traffic areas would just not be worth it. And will carpet with shorter pile be comfortable under your feet? Ed walked us through how important it was to find one that would wear well in high traffic areas – the stairs especially. Carpet can be the having a 5th wall – it drastically changes things in each room. Keep that in mind as you shop for a good match for each room and/or space. For us it was important to stay neutral and be able to change decor around our carpet. I think that’s a good rule in general but might not work for some. It’s important to consider the feel you’d like to achieve in each space – do you want your flooring to stand out? Or be a quiet backdrop to the room? Do you have a classic style? Going with a bold pattern on something long term wouldn’t be for the best. The best place to consider going with a more bold look are in bedrooms. Isolated, smaller spaces are perfect for splash of color or style, while a main living space wouldn’t be as well suited. Don’t make a decision immediately. This is an investment that you’ll be walking on for years. Bring those samples home! 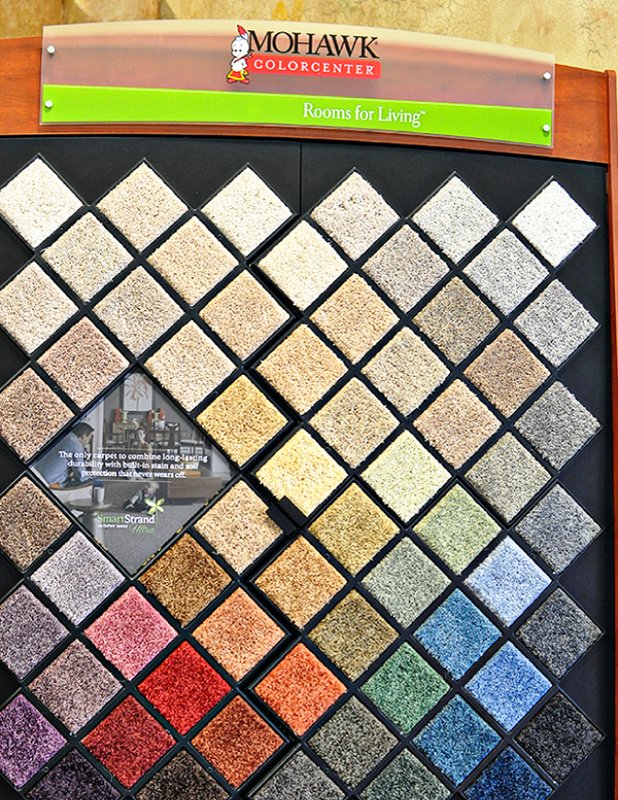 Ask for larger samples if possible because getting a small square of carpet is like getting a paint swatch. It looks different as it is spread over a large space. At my visit to the showroom, I learned all about the process behind carpet. It was intriguing – who would’ve thought?! I was impressed with Mohawk Flooring and the new(er) process that they are using with SmartStrand. I thought it was so awesome that any and all stains could be cleaned with just water and messes and that it still would feel soft. We debated on colors and patterns, what would look good within our home but I was excited that whatever we chose with Mohawk would be a good fit for our family. I asked for lots of opinions (on Facebook and Instagram in addition from friends and family) from people who loved or hated what they have in their homes. Some people love pattern, others hate it. In the end I went with neutrals that could be the base for whatever decorating we do. We did pattern on the stairs and a more plush in our bedrooms. I’m thrilled with the results and can’t wait to share more. Do you have any other sanity saving tips? Share them in the comments. 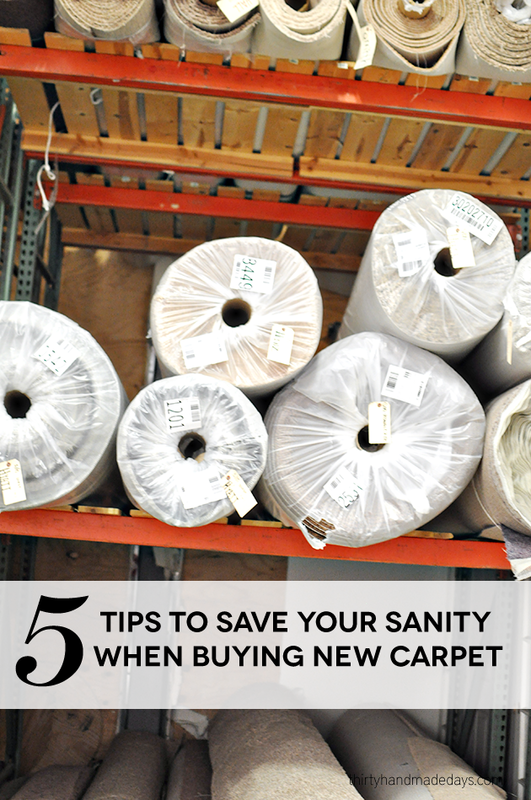 To read this blog post on Thirty Handmade Days, visit 5 Tips To Save Your Sanity When Buying New Carpet. Mique (as in Mickey) started 30 Days as an idea file a few years ago. After five years and thousands of ideas, she now realizes that she’ll never check them all off her list. When she’s not creating, Mique loves spending time with family and friends and long drives, especially if they end at the beach.